Stars from the hit musical We Will Rock You will come together to perform an outdoor concert of Queen’s sensational music at The Pattonair County Ground in Derby on Saturday 24 August. A dazzling collection of performers from London’s West End come together to present an incredible tribute to one of the world’s great rock bands. Featuring dozens of hits from an astonishing back catalogue, this is an amazing concert evening no Queen fan should miss. 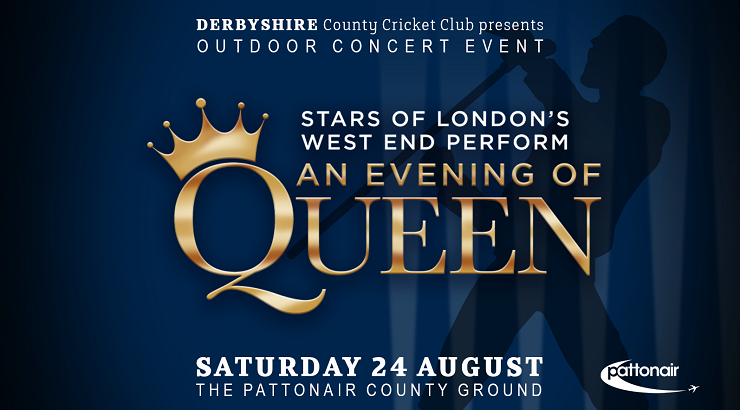 Tickets for An Evening of Queen start from just £24 and are on sale now via derbyshireccc.com, reception at The Pattonair County Ground or by calling 01332 388 101. Only a limited number of tickets are available for this special event. Unfortunately, no food, picnics or drinks are to be brought into the ground. Food and drink outlets will be available on the night. Picnic blankets are allowed for people who wish to sit on the outfield during the performance. Buy tickets online at derbyshireccc.com. Should you have accessibility requirements please contact us on 01332 388 101. On-site car parking (subject to availability) can be pre booked at £5 online derbyshireccc.com or by calling 01332 388 101. Please note that only a limited number of on-site car parking spaces are available and the only way to guarantee your spot is by booking in advance. For disabled parking tickets, please call 01332 388101. Make the most of your evening of Queen with VIP Hospitality. This includes reserved seating, car parking, arrival drink, two-course meal, cheese and biscuits and post-concert DJ. Hospitality is priced at just £75 per person. For more information about Stars of London’s West End perform An Evening of Queen, please call 01332 388 101 or email info@derbyshireccc.com.